First of all do not be afraid! 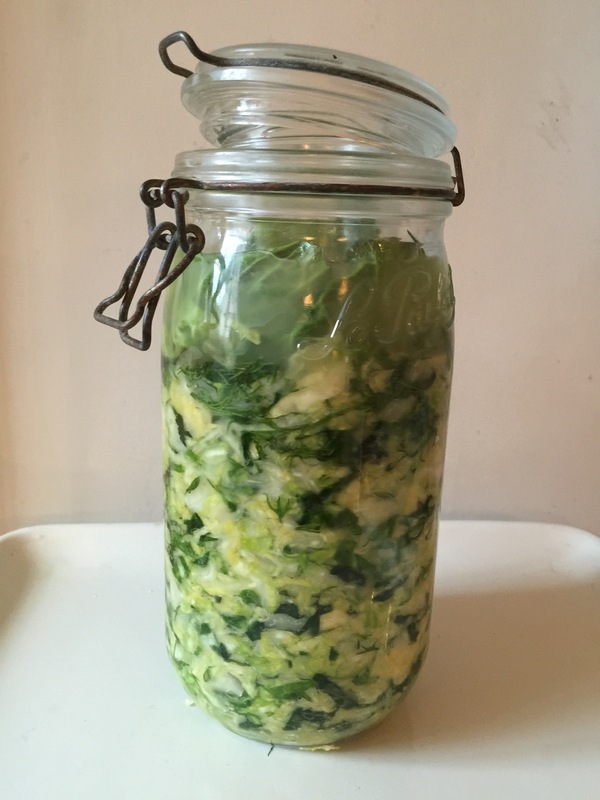 When I first got interested in the idea of fermenting I was quite nervous, making sauerkraut went against everything that that we are taught about health and safety. The thought of food being left on our kitchen counters for days on end at room temperature was very scary. As long as certain procedures are followed there is nothing to be afraid of. Make sure everything you use is clean. Wash hands, utensils and your jar. Straight out of the dishwasher is good. The salt to cabbage ratio is also important, 3tbs of salt to 5lbs of cabbage. You can halve this amount if you want less. Also the most important thing of all is that your cabbage stays submerged beneath the brine. Use the freshest cabbages, preferably organic. Also remember that preserving vegetables in this way has been practiced for thousands of years. What we are coming to realise, is that we need to eat more like our forefathers, who relied on fermented foods to keep and preserve their food before refrigeration. Treating food in this way also had the added benefit of supporting their overall health by enriching their gut with friendly bacteria and boosting their immunity. Today these old methods of preserving food are being rediscovered, not only as something that tastes good, but also as an easy way to get probiotics into our diet. The amazing fact is that by fermenting cabbage it raises the bioavailability of nutrients making it even more nutritious than in its unfermented state. By eating sauerkraut you will be doing your health a huge favour. The beneficial bacteria in it will support your immune system, improve digestion, keep you regular and help clear skin conditions such as psoriasis and acne. Recolonising the digestive tract with fermented food has a direct effect on mental health and wellbeing. There is plenty of research to back this up and it has been well documented that the gut serves as if it were our second brain. To get the benefits though, sauerkraut needs to be raw. Shop bought sauerkraut tends to be pasteurised, unless it’s stated that it’s raw on the lable. You will either need to make it yourself or buy it from a farmers market or health food shop. Pasteurisation requires heat which kills the microorganisms thus rendering it devoid of all the probiotic bacteria needed to enrich and aid healthy digestion. 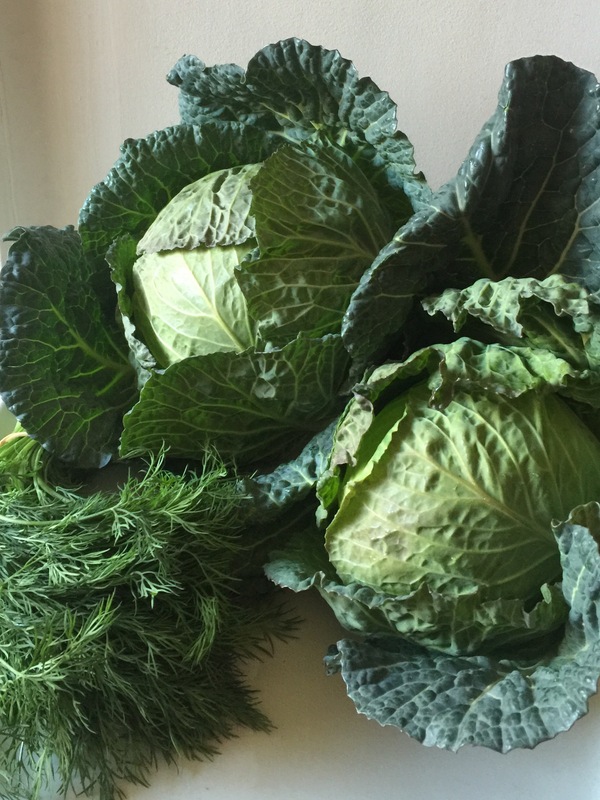 Saurerkraut has quite a tang to it and can be quite tart, this is due to the sugar in the cabbage which is converted into lactic acid, it is the lactic acid which is responsible for preserving the cabbage and preventing it from going bad. At first I wondered if we would eat all the sauerkraut I was making, now, if I don’t have it with my meal, I feel there’s something missing. It seems to balance out the tastes and it goes with everything. It’s probably not unusual to desire this slightly sour tangy taste and certainly is better for you than reaching for the ketchup or vinegar. Even though the fermentation process might seem long and complicated it is in fact something which has been practised for thousands of years in ancient cultures and civilisations all over the world. It is actually nothing more complicated than slicing cabbage adding salt, pounding with a blunt instrument or squeezing with your hands to draw water from the cabbage and then packing into a large glass jar or crock. The most important thing to remember is that the vegetables must stay submerged under the brine to prevent the sauerkraut from spoiling. 1 very clean large wide mouthed jar or kilner jar. Straight from the dishwasher is perfect. Discard the outer leaves from your cabbage. Cut the cabbage into quarters and discard the core. Cut across the quarters into very thin slices. Transfer the shredded cabbbage to a bowl and sprinkle in the salt as you go. The salt pulls water out of the cabbage. This will create the brine in which the cabbage can ferment without going bad. You can add the dill at this point. With very clean hands start to massage and squeeze the cabbage and salt together. You can also pound it with a blunt instrument like a rolling pin. After about 5 to 10 minutes the cabbage will become quite watery and limp. Using your hands or some tongs start to pack the cabbage into your jar tamping down with your rolling pin or fists. Packing it in hard like this helps force more water out of the cabbage and also stops there being any air pockets which could spoil your kraut. Pour any of the liquid that may be left in the bowl into the jar. I like to use one of the discarded outer cabbage leaves and place it over the sauerkraut tucking it in down the sides of the jar. This helps to keep the sauerkraut submerged beneath the brine. On top of this fill up a smaller jar with water or something like marbles to act as a weight. It is of vital importance that the sauerkraut is submerged. Cover the jar with a piece of cloth and secure with some twine. This will keep out the dust and flies while its fermenting. It is normal for there to be bubbles while its fermenting and sometimes a white foam or scum which you can skim off, if you see any mold remove it immediately, this shouldn’t effect the sauerkraut below the brine which is anaerobically protected. Keep the jar away from direct sunlight and in a coolish temperature although the cooler the temperature the longer it will take to ferment. It should take about 10 days but you can taste it every day or too to get the flavour you like. I have been known to leave mine for months and it has been fine. Once you get your desired taste put it in the fridge. Sauerkraut should have a clean and fresh smell even if it’s a little sour. I have found using a food processor can make the sauerkraut slimy and soft and that either a sharp knife or a mandolin is the best tool for the job, giving a crunchier end result with better texture. Don’t fill the jar up to the top, as the cabbage ferments it will release more water which will spill over the top. Also you need to be able to fit a weight into the jar as well. Over the next 24 hours keep pushing the little jar down from time to time to make sure the brine comes above the cabbage. Sometimes if the cabbage is old it may not produce enough liquid, in this case add some salt water which you can make by adding 1tbs of salt to 1 cup of water. Stir until its dissolved and top up. It is important to use a clean utensil every time you take sauerkraut out of the jar so as not to introduce bad bacteria into the ferment which will contaminate it. 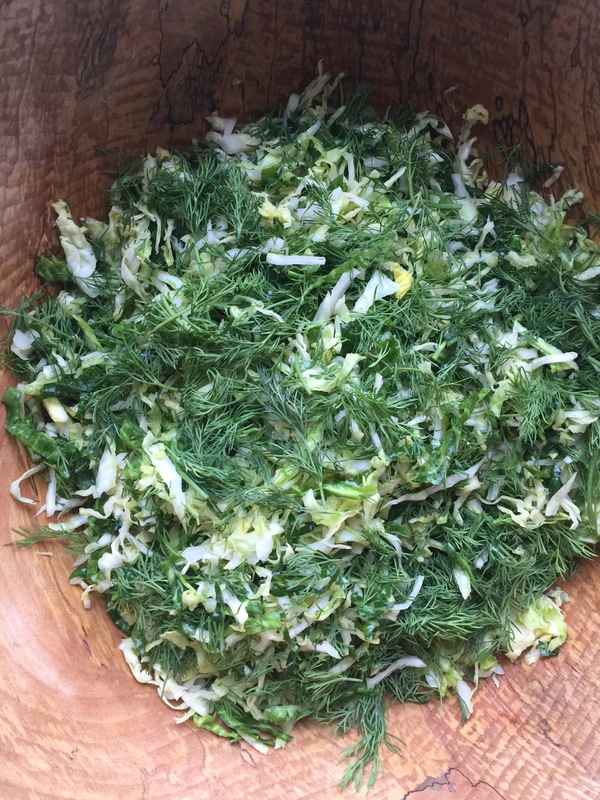 This entry was posted in Fermentation, Gluten Free, Psoriasis, Recipes, Uncategorized and tagged cabbage, dill, fermenting, gut health, sauerkraut. Bookmark the permalink.